Today we had a visit of António Roquette and a group of Esporão collaborators. They visited the excavations of Era and Málaga teams. Meanwhile, at sector Q we removed the last deposit in the area of the circular structure and another circular pit appeared. And the presence of the new ditch (ditch 13) was confirmed. 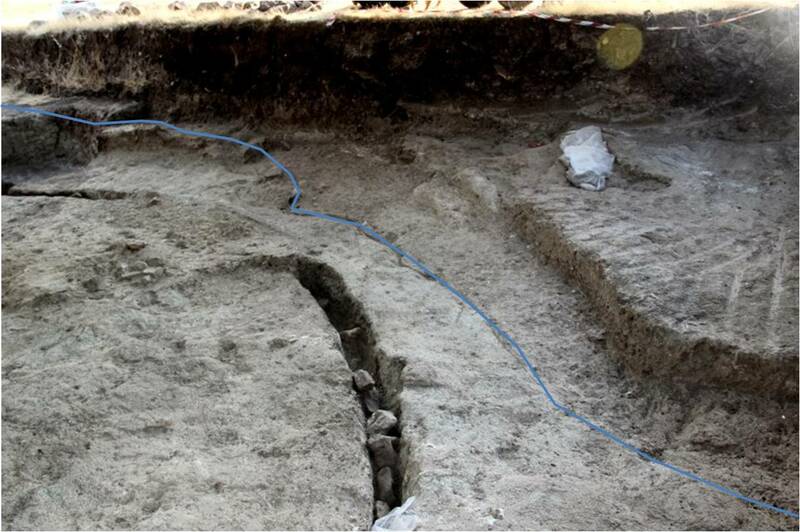 A new section was detected and started to be excavated in the NE side of the circular structure and cut by Late Neolithic ditch 6 (red line). It makes a curve into the section of the survey area, so two hypotheses are possible: the ditch makes a curve and goes back into the survey area, connecting with the segment detected in the western side or there is an interruption corresponding to a gate orientated to North. The materials indicate a Neolithic chronology and now the several Neolithic pits in that area start to be seen as pits that might be related to the internal area defined by this new ditch. This central area of Perdigões is, in fact, quite complex, for there we find structures related to all the chronological span of the site.